Changes in Genuine Service, Secure Plus, and World Coin submissions were announced Wednesday by PCGS President Don Willis, with some changes immediately effective and others going into effect on Nov. 15, 2011. This is the second major change in service that PCGS has made in the past four months. In June, the company added plus grading at no extra charge for all Economy submissions, including both Standard as well as Secure Plus. PCGS Secure Plus also was expanded in June to include Economy level submissions, and coins graded “Genuine” also were allowed in Secure Plus holders. Coin Update and Coingrader Capsule had advocated for many of those earlier changes, as we discuss in this post applauding Willis and the enhanced emphasis on serving customers. These new changes are in the same mode, and again we applaud. One of our favorites is a new option, “Genuine with Details,” offered at no extra charge. NGC offers this service, which is helpful in ascertaining a coin’s general condition. For instance, an 1884-S Morgan dollar is a condition rarity in mint state, with PCGS values at $25,000 in MS62. 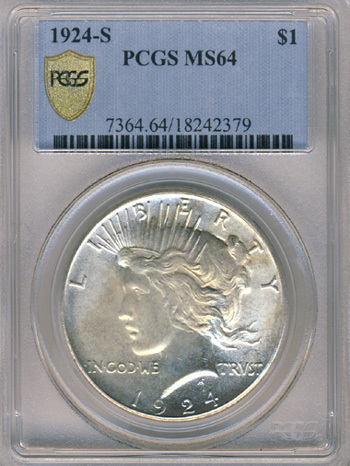 An 1884-S graded “Cleaned–AU Details” in a PCGS holder would have wide appeal and enhanced value. In particular, this service will go far with condition rarity coins and ones offered for bid in online auctions, competing with NGC Details coins on portals like Proxibid and eBay or in houses like Heritage and Teletrade. However, some Details descriptions are undesirable on certain coins. For instance, I keep in my bank box an 1862-S Liberty Head quarter eagle that was once part of jewelry. It don’t want that in a holder that states: “Genuine (98 – Damage or Tooling).” I’m not trying to hide the damage. The reason is the rarity. That label just doesn’t do justice to a coin with fewer than 100 known to exist. Now collectors have a choice. Willis says new submission forms will be available in a few weeks, but “Genuine with Details” is effective immediately. Simply write it on your submission form, he says, noting that one cannot mix Genuine services on one submission form (which again makes sense from a handling perspective). Secure Plus will now be offered on all services for all coins through Grading and Regrading submissions (no crossovers). This includes Modern ($20), Mint Errors ($65), Special Issues ($65) and Show Economy ($75). This is effective immediately. Note: Request this on the submission form until new forms are available. All coins, both US and World, minted since 1955 and valued up to $1,000 can be submitted under the Modern Service. Chinese coins minted from 1955 to date will no longer have to be submitted through Secure Plus. This will be effective for all orders received after November 15, 2011. Note: All World Coins minted before 1955 must be submitted through Secure Plus (which will help identify counterfeits). Other changes concerned upgrading Collectors Club membership and shipping account charges. In recent months, PCGS also has provided excellent customer service. We see all these changes as competitive and helpful. In the past, again as we have noted in older posts, such as this one, Coingrader Capsule has encouraged PCGS to de-emphasize its marketing niche as the premier grading service and to move toward more customer friendly service. We appreciate his moving the company in a continuously upward trajectory. Is there some reason why PCGS can not be the premier service AND have friendly customer service? Are these goals really in opposition to each other? I think PCGS is on its path to do both–premier and excellent service.